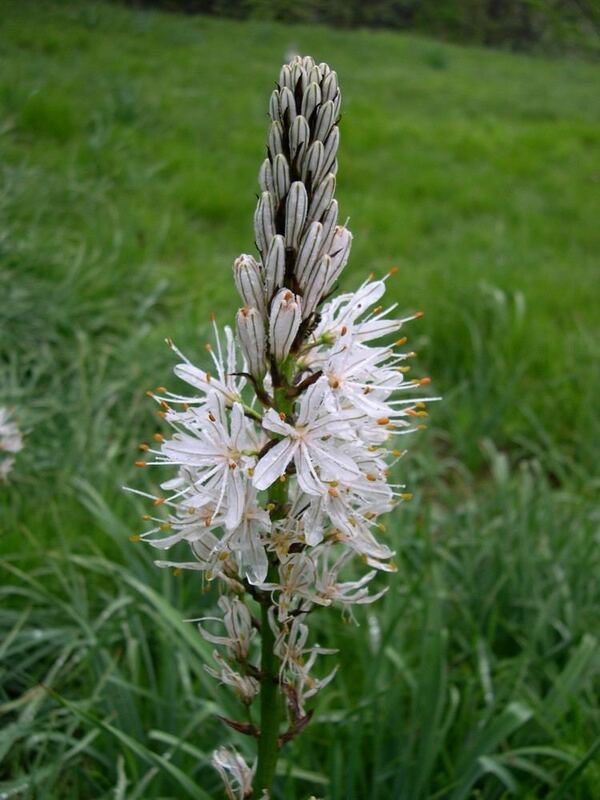 Asphodelus is a genus of mainly perennial plants first described for modern science in 1753. The genus is native to temperate Europe, the Mediterranean, Africa, the Middle East, and the Indian Subcontinent, and now naturalized in other places (New Zealand, Australia, Mexico, southwestern United States, etc.). Asphodels are popular garden plants, which grow in well-drained soils with abundant natural light. 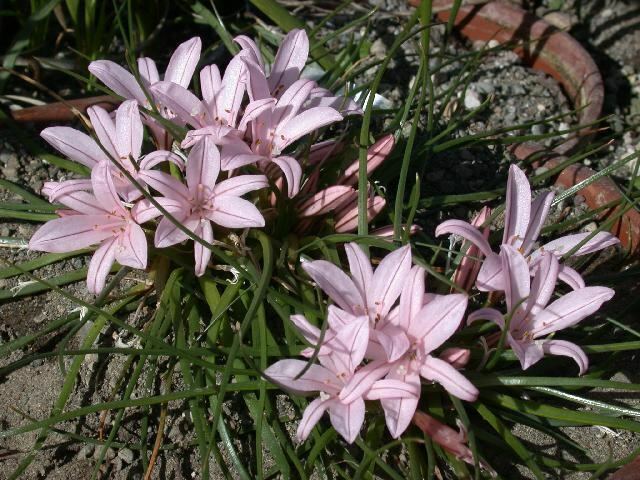 Now placed in the family Asphodelaceae, the genus was formerly included in the lily family (Liliaceae). The plants are hardy herbaceous perennials with narrow tufted radical leaves and an elongated stem bearing a handsome spike of white or yellow flowers. 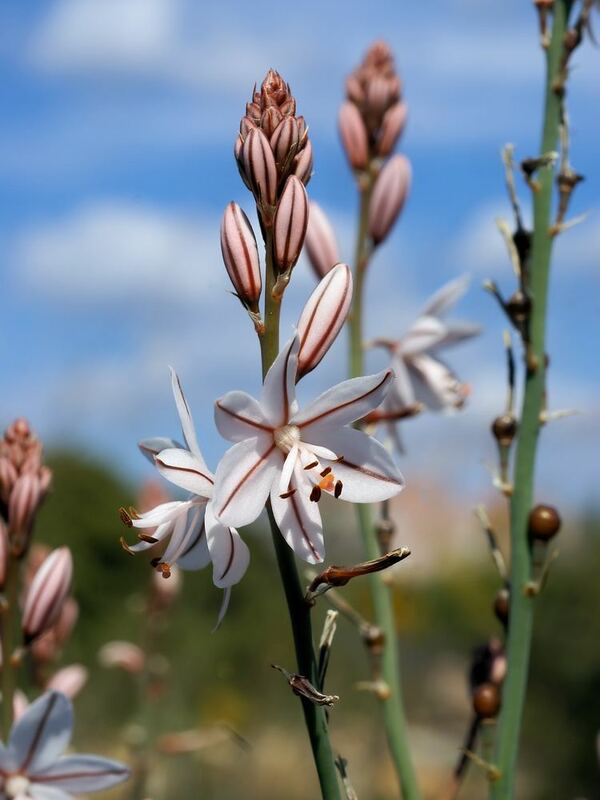 Asphodelus albus and A. fistulosus have white flowers and grow from 1½ to 2 ft. high; A. ramosus is a larger plant, the large white flowers of which have a reddish-brown line in the middle of each segment. The leaves are used to wrap burrata, an Italian cheese. The leaves and the cheese last about the same time, three or four days, and thus fresh leaves are a sign of a fresh cheese, while dried out leaves indicate that the cheese is past its prime. In Sardinia, honey produced from bees who have fed on the plant is highly favored for its delicate taste. In Apulia, the unopened buds of the plant are collected, blanched in boiling water, and preserved in olive-oil to be used as a condiment. 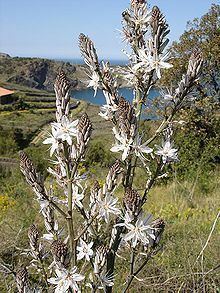 In some areas of Sardinia, especially Tinnura and Flussio, the stems are used to weave baskets used in bread-making. At one time, these were an indispensable part of the trousseau of a bride-to-be. Women in Elizabethan Lancashire used it as a yellow hair dye. 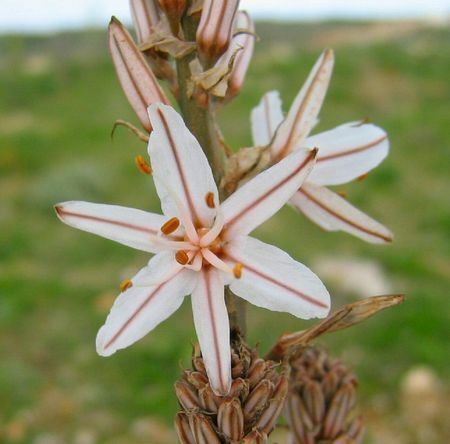 The asphodel is mentioned by several poets in connection with the mythology of death, and by association, the afterlife - specifically the Isles of the Blessed and Elysium - part of the ancient Greek concept of the afterlife. Milton: "To embathe In nectared lavers strewed with asphodel." Pope: "Happy Souls who dwell In Yellow Meads of Asphodel, Or Amaranthine Bowers." Tennyson: "Others in Elysian valleys dwell, Resting weary limbs at last on beds of asphodel." Cohen: "But in his lapel, discreetly, he wore a sprig of asphodel." Longfellow: "He, who wore the crown of asphodels, Descending, at my door began to knock." Barrett Browning: "As one who stands in dewless asphodel, Looks backward on the tedious time he had In the upper life." William Faulkner: "There asphodels are scattered through the night, Like ghosts of young beseeching hands." ONE WHO WAS LEFT LIVING, CHANSONS AU PRINTEMPS, handwritten with drawings, 1919, W. Faulkner, RFC Conrad Aiken: "Snowflake on asphodel--how clear, how bright / Snow's death on dying flower, yet both immortal" William Carlos Williams: "Asphodel, that greeny flower"
Powdered root of asphodel is mentioned as an ingredient in a sleeping potion in Harry Potter and the Philosopher's Stone by J. K. Rowling. In The Picture of Dorian Grey by Oscar Wilde, Lord Henry talks of old lovers: "I had buried my romance in a bed of asphodel." 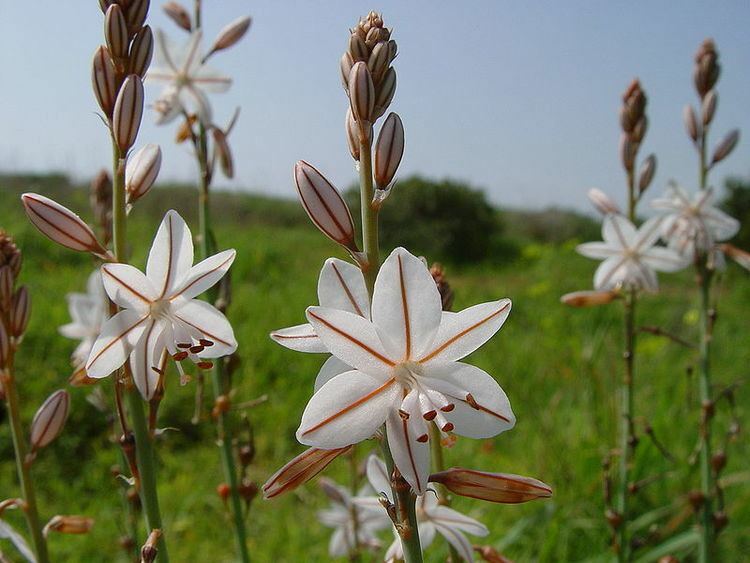 In Vladimir Nabokov's 1941 novel, The Real Life of Sebastian Knight, the protagonist's last novel bears the title The Doubtful Asphodel, obviously alluding to the plant's association with death. The word is a loanword from Greek. Its original version is ἀσφόδελος. There are 16 species in the genus. Asphodelus bakeri Breistr. - Western Himalayas of northern India, northern Pakistan, etc.